WASHINGTON --- Senior Navy, Marine Corps and Air Force leaders outlined priorities for combat aviation during a House Armed Services Committee hearing here yesterday. Speaking for Navy and Marine Corps aviation, Navy Vice Admiral Paul A. Grosklags, commander of Naval Air Systems Command, told committee members he believes the DoD budget agreement covering fiscal years 2018 and 2019 is aligned with and supports the National Defense Strategy in rebuilding military readiness while providing a more lethal force. “The lethality which naval aviation brings to bear in support of our nation's interest will be greatly enhanced by the increase procurement numbers for aircraft and weapons, increased investment in the development of new and advanced capabilities and increased funding of our critical readiness and sustainment accounts,” Grosklags said. Grosklags provided aviation priorities for the Marine Corps and Navy. 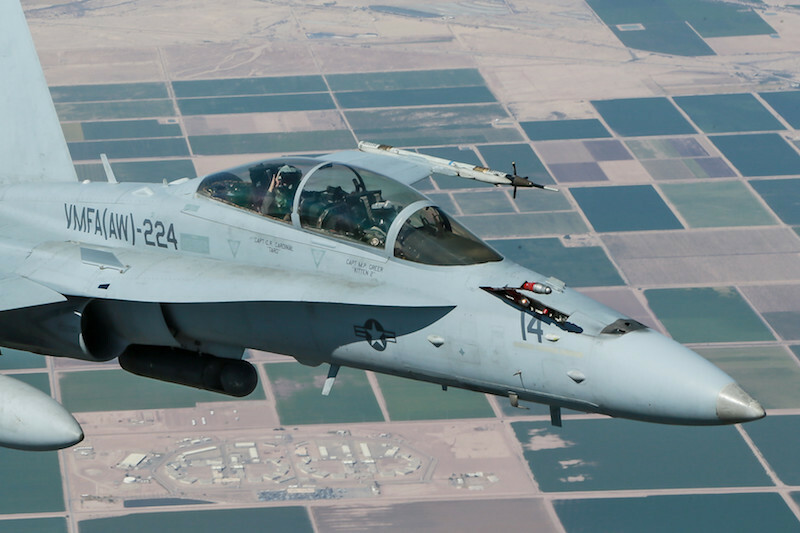 -- Maintaining lethality of legacy F/A-18 Hornet aircraft. -- Development of the MQ-25 unmanned air system and the next generation jammer. A critical priority for the Navy and Marine Corps is full funding for aviation readiness accounts, including spares, officials said. Naval and Marine Corps leaders also told committee members their services are committed to flight safety and are dedicated to reducing the likelihood of accidents. Marine Corps Lt. General Steven R. Rudder, deputy commandant of the Marine Corps for aviation, told the committee his service is maximizing efforts to prevent aerial mishaps, and taking corrective actions if they occur. More money, Rudder said, is being spent on aircraft maintenance to keep older airframes in good shape. “We’re giving maximum amounts to our [maintenance and parts] depots; maximum amounts to buy spares, giving max amounts to program managers so they can fix the airplanes,” Rudder said. The general also said the Marines are stepping up efforts to buy new aircraft to replace older, more maintenance-prone aircraft. The demand for Air Force capabilities continues to grow, as the United States experiences a more competitive and dangerous international security environment, Air Force Lt. General Arnold W. Bunch Jr., military deputy for the Office of the Assistant Secretary of the Air Force for Acquisition, told the committee. The Air Force is supporting combatant commander requirements in response to growing challenges from Russia, China, North Korea and Iran, in addition to the counterterrorism mission in the Middle East and around the world, Bunch said. Air Force spending priorities include F-35 aircraft procurement, sustainment and modernization, KC-46 aerial refueler aircraft for their power-projection role, and the B-21 Raider bomber development program, Bunch said. According to the general, these efforts are key to the Air Force so it can answer the nation's call when needed. Bunch said his plan for the Air Force is to drive innovation, reinforce budget discipline and deliver capabilities with greater affordability at the speed of relevance. “Today's modernization is tomorrow's readiness -- readiness is not static,” the general told the committee. The Air Force, he said, will continue its efforts to bolster readiness, increase lethality and modernize in a cost-effective manner.